Spilling out wrenching tales of lost lives and stolen safety, students with quavering voices and parents shaking with anger appealed to President Donald Trump to set politics aside and protect American school children from the scourge of gun violence. 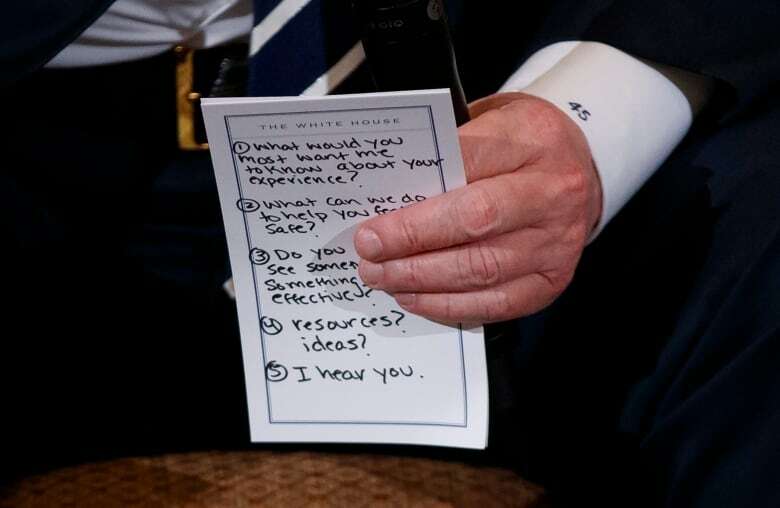 Spilling out wrenching tales of lost lives and stolen safety, students with quavering voices and parents shaking with anger appealed to U.S. President Donald Trump on Wednesday to set politics aside and protect American school children from the scourge of gun violence. Trump listened intently as raw emotions reverberated at the White House. Faced with the personal anguish wrought by the school shooting in Parkland, Fla., that left 17 dead, Trump pledged action, saying: "We don't want others to go through the kind of pain you've been through." Sam Zeif, who was on the second floor of the school during the shooting, talked about his fear and exchanging terrified text messages with his brother, who was also inside the school. Cary Gruber, father of a Parkland student, implored Trump: "It's not left and right… if you can't buy a beer, shouldn't be able to buy a gun." "I don't believe teachers should be armed. I believe teachers should teach," said Israel. Angry students, teachers and parents booed Rubio when he indicated that he would not support an assault-weapons ban and also voiced their displeasure when Dana Loesch, spokesperson from the National Rifle Association, when she said the answer was not to ban weapons but to ensure they stay out of the hands of the mentally ill. Among the group Trump hosted were six students from Parkland, including the student body president, along with their parents. Also present were Darrell and Sandra Scott, whose daughter was killed in the Columbine, Colo., shooting, and Nicole Hockley and Mark Barden, who lost children in the Sandy Hook elementary school shooting. Students and parents from the Washington area also were present. Not all the students affected by the shooting came to the White House. In the Senate, Democrat Dianne Feinstein and Republican Jeff Flake said they will introduce a bill to raise the minimum age required to purchase rifles from gun dealers, including assault weapons such as the AR-15. "A kid too young buy a handgun should be too young to buy an .AR15," Flake said on Twitter. The bill he and Feinstein support would raise the minimum purchase age for non-military buyers from 18 to 21, the same age required to purchase a handgun. Trump embraced gun rights on his campaign, though he supported some gun control before he became a candidate, backing an assault weapons ban and a longer waiting period to purchase a gun in a 2000 book. Students were also calling for change from state legislators in Tallahassee, the state capital. Throughout the day Wednesday, television news showed footage of student survivors of the violence marching on the capitol, calling for tougher gun laws. Ryan Deitsch, an 18-year-old Grade 12 student at the Parkland school, spoke to reporters inside, saying lawmakers have not taken action to reduce gun violence and instead have been guilty of using "political double talk as much as they can." "It's not a weapon I want them to use any more. The more they don't act, the more they don't deserve to be in office," he said. 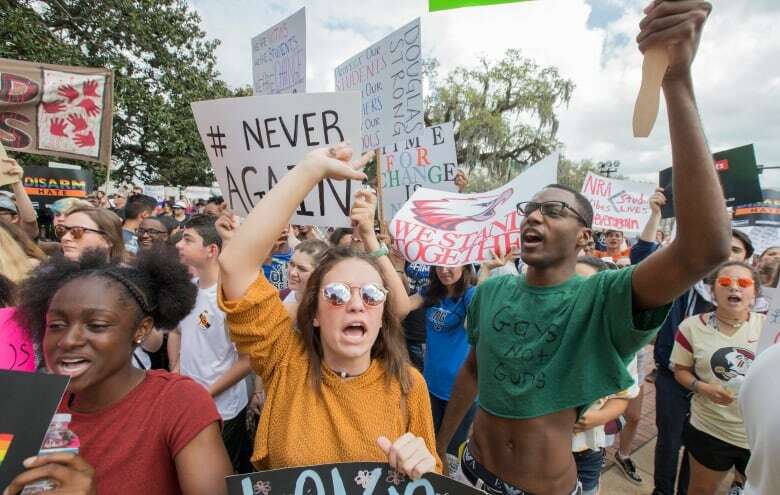 "Parkland is a beautiful, safe town, and now it's ruined," said Alfonso Calderon, a 16-year-old Grade 10 student at the school. Tyra Hemans, a Grade 12 student at the school, told CBC News on Wednesday that she survived last week's shooting because she heard the early gunshots and ran for her life. Hemans was among the students in Tallahassee calling for action from politicians — and calling out past inaction. "If you wanted to try and make change, you should have made the change [in] 1999," she said, referring back to the deadly shooting at Columbine High School in Colorado, when two teenagers killed 13 people before killing themselves. Brandon Wolf, a survivor of the June 2016 mass shooting in Orlando, spoke to the students and the crowd about what it was like for him to listen as gunshots ripped through the Pulse nightclub, killing his friends and dozens of others. He said the choice for Republican legislators is clear: "Either do your jobs or get the hell out of our way." At one point, about 30 people left an anti-gun rally outside Florida's Old Capitol and began a sit-in protest at the office of four House Republican leaders, demanding a conversation about gun legislation. On Tuesday, Trump directed the Justice Department to move to ban devices like the rapid-fire bump stocks used in last year's Las Vegas massacre but it's unclear whether the Justice Department even has authority to regulate bump stocks and arguing that the background check legislation would not go far enough. ATF reviewed the devices and approved them in 2010, finding they did not amount to machine-guns that are regulated under the National Firearms Act that dates to the 1930s.